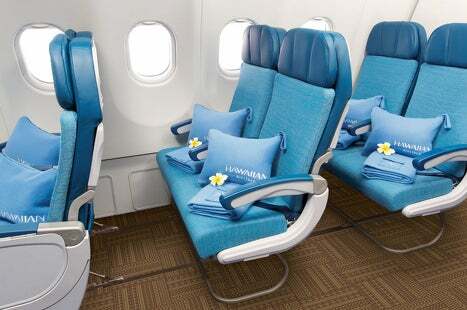 Hawaiian Airlines announced it would be adding premium economy seats to its long-haul A330’s back in October, and it looks like the seats are finally on sale for flights starting August 1, 2014. Hawaiian’s new Extra Comfort section. Billed as “Extra Comfort” seats, these are just Hawaiian’s standard economy seats with 36 inches of legroom instead of the normal economy 31 inches. Still that extra 5 inches should make a difference on the airline’s long-hauls like those from Honolulu to New York and Sydney. The A330’s will have an Extra Comfort section of 40 seats total with 236 seats in economy and 18 seats in first. Hawaiian has no plans to refurbish its 767’s, but will continue to offer paid Preferred Seating in bulkhead and exits, and only plans to operate a few of the planes by 2020 while phasing them out in favor of A330’s. Extra Comfort seats are going for as low as $40 each way, and are already on sale in August. It looks like the premium seats will cost $100 each way from the airline’s hub in Honolulu to New York and Sydney, and $40-$60 each way to various West Coast cities based on the date and available fares. 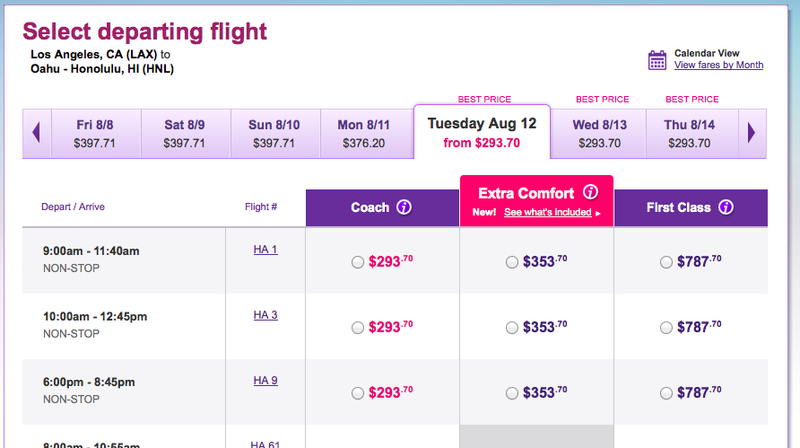 Seats on the HNL-SYD route are going for $100 each way. For the time being, it doesn’t look like you can book these seats outright using miles – there’s no mention of them on the award chart, and the award calendar is just pricing out regular economy and first class options. The new premium economy seats aren’t pricing out in awards yet. 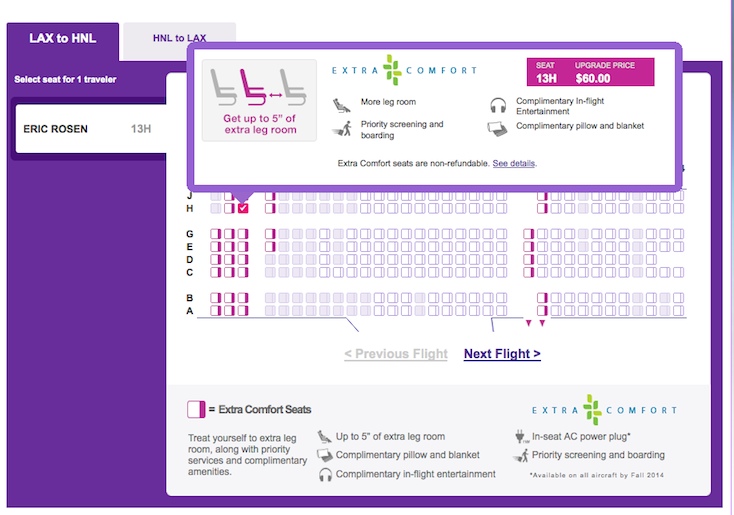 However, when you get into the booking process and use your miles, when you get to the seat selection page, it will let you pick an Extra Comfort seat and pay to upgrade to it, the same as you would if booking a paid ticket. You can book an economy award and pay to upgrade right now. So this could be an inexpensive way to use your miles and then pay a cash co-pay to upgrade. 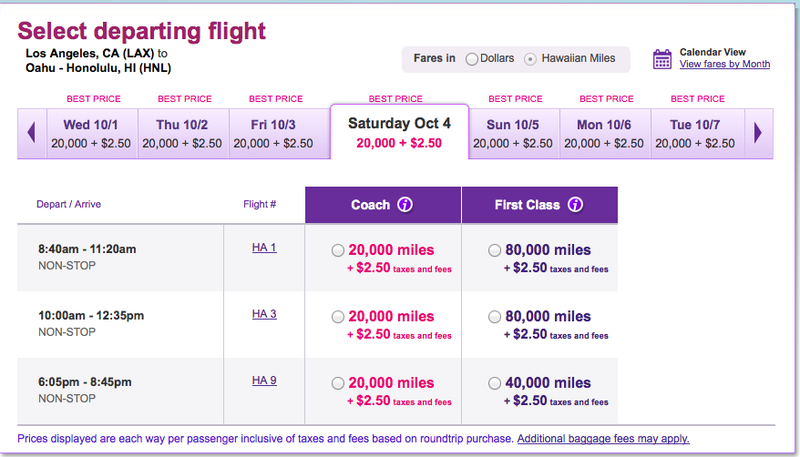 Just as a reminder, Hawaiian award tickets start at 20,000 miles each way between the Mainland and Honolulu. Hawaiian is also a transfer partner of Amex Membership Rewards, and also introduced new Barclaycard co-branded credit cards in January with sign-up bonuses of 35,000 miles – enough for a discounted roundtrip award from North America to Hawaii. Hawaiian offers non-stop service to Hawaii from 11 US gateway cities as well as to Japan, South Korea, Taiwan, Australia, New Zealand, American Samoa, and Tahiti. April 2014 will see the launch of Honolulu-Beijing flights as well, and the airline operates around 160 intra-island flights each day.